Before continuing, take a few minutes to congratulate yourself for reaching the 6th level of our push up challenge – Close Grip Push ups. Most people never venture beyond the 5th level, the basic push up. From now on the challenges will be greater, but we can also direct the benefits more specifically as well. We have been talking about our admiration for push ups throughout this series. This is why we decided to develop this 10 level challenge that allows you to gradually develop strength and attempt more challenging push ups as you progress towards the higher levels. After overcoming the Final level of the Full Range Push Ups (the regular push up), step over here and challenge yourself with Close Grip Push Ups. Once you touch the hands, hold for a second then start to slowly return to the starting position, while breathing out. Continue repeating until you reach your reps goal. Close grip push ups are well known and usually used as a triceps development vehicle. They are also necessary for proper strength development, but are often neglected in favor of other push ups, for example, the raised foot push up. This is a shame, because close grip push ups are the starting point from which we learn to conquer one hand push ups. Most people cannot handle one hand push ups because their elbows are in an unnatural position. 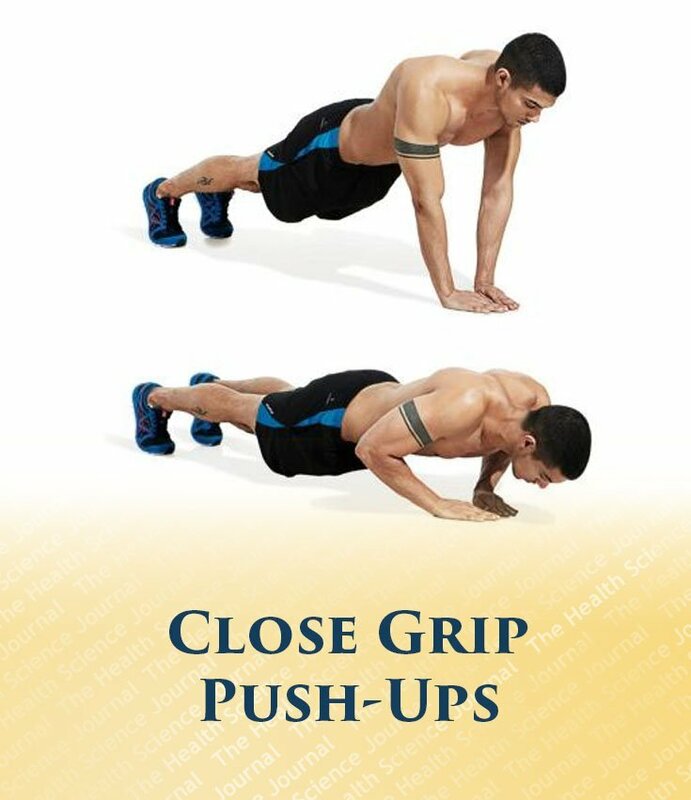 In the close grip push ups we learn to position the hands to allow the elbows to naturally bent at a large angle, which allows to increase the depth of the push up (as opposed to the regular push up, where the position of the hands somewhat limits elbow mobility). By increasing the angle of the elbow bend we train triceps and strengthen the elbow and wrist tendons. Once we have strengthened the elbows with the close grip push ups, one hand push ups stop being a problem. If you are unable to complete the first level of close grip push ups, continue to practice full range push ups, but move your hands closer and closer every time, while maintaining a large number of reps.
After overcoming the Final Level of close grip push ups, continue with the next exercise – Uneven Push Ups.